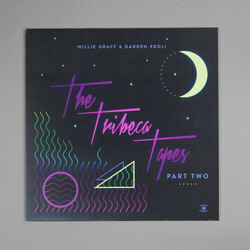 Willie Graff & Darren Eboli - Tribeca Tapes Part Two. Vinyl EP. Bleep. Fresh from working the clubs of New York and Ibiza, DJ Willie Graf reunites with his partner in dance Darren Eboli for a second instalment of their Tribeca Tapes series. ‘Ahimsa’ is like their mission statement; a strutting, looped breakbeat, punctuated with indecipherable samples from myriad global sources, popping in and out. Chilled vibes with room for movement is their job description, and they do it well. But then again, what did you expect?